To celebrate our 35th wedding anniversary we had booked to go on a boat trip from Liverpool to Acton Bridge on a steamship called the Daniel Adamson. Sadly the boat trip was cancelled but we decided to go to Liverpool anyway. We drove up to Anderton in Cheshire and went up the Anderton Boat Lift. Then we drove to our hotel in Liverpool. At the last minute we had been able to get tickets for the Don McLean concert at the Liverpool Philharmonic Hall. We walked up through the city past these 'suitcases'. We had dinner at The Philharmonic Dining Rooms which have the only Grade II listed Gents toilets. Roger had to take this for me! Then off to the concert. I have always loved Don McLean so it was wonderful to see him live. He played some songs we knew and songs we didn't and eventually, YES! - there was American Pie and Vincent. So that was Sunday. Now to Monday - our wedding anniversary. We walked from the hotel to Albert Dock where we found the steamboat we had been due to go on. They were trying to repair it. We were invited on board and given a conducted tour. Roger & I have different interests and I suppose one of the ways our marriage has lasted is that we respect those differences and don't feel we have to spend every minute together - even on our wedding anniversary trip. So he went to look at all the boats in the dockyard and I went round Tate Liverpool. This was a Mondrian which wasn't at all what I expected. And this was an interactive piece which had to be closed down as people had been far too interactive and it had broken - so no lying down on a hammock for me! 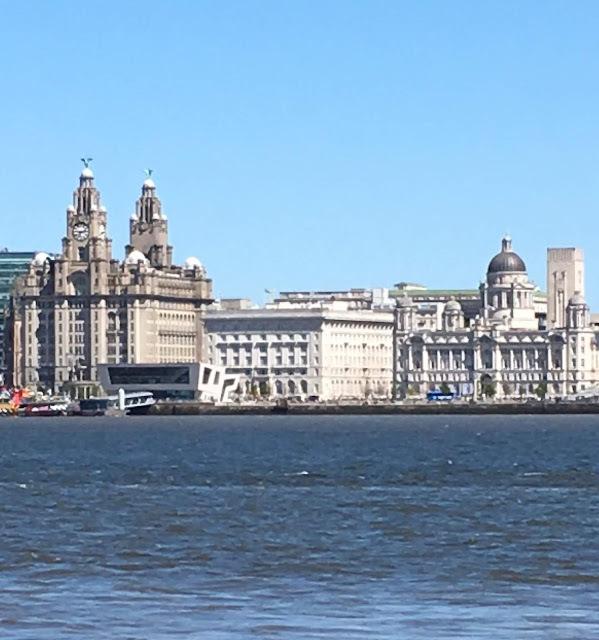 We wandered along the dockside and went on a 50 minute tour on a Mersey Ferry. The ferry has currently been 'razzle-dazzled' by Sir Peter Blake. We got off the ferry at Birkenhead and found a beautiful square with gardens and fabulous buildings. We had lunch at a cafe with this view. Returning to Liverpool on the next ferry, we went to the Slavery Museum and Maritime Museum together but after a short time I left Roger to the museums and I walked up to the Central Library to see a handmade book exhibition. The Library itself is spectacular. The curator opened this glass case so I could take a photo. We met back up together and decided to go back to the hotel and get the car. We drove out to Crosby Beach to see the Antony Gormley 'Another Place'. We had a superb Turkish dinner and went back to the hotel. What a lot we had crammed into our trip so far. I think I'll save Tuesday for another post. Well done, if you've got this far. What a great trip Bernice. Thanks for sharing. And again..Congratulations both. Love your travel posts so much. Is the statute suppose to be tilted over or had it sunk down? It was a surprise to see people on the beach along with the windmills - how I wish US would promote public art but can just imagine the horrible results after the newness wore off. People are so disrespectful. Laughed out loud at one of the handmade books in your picture - great exhibit! The 'windmills' are a long way out to sea - the people were nowhere near them! I think the statue has fallen due to the action of the sea.